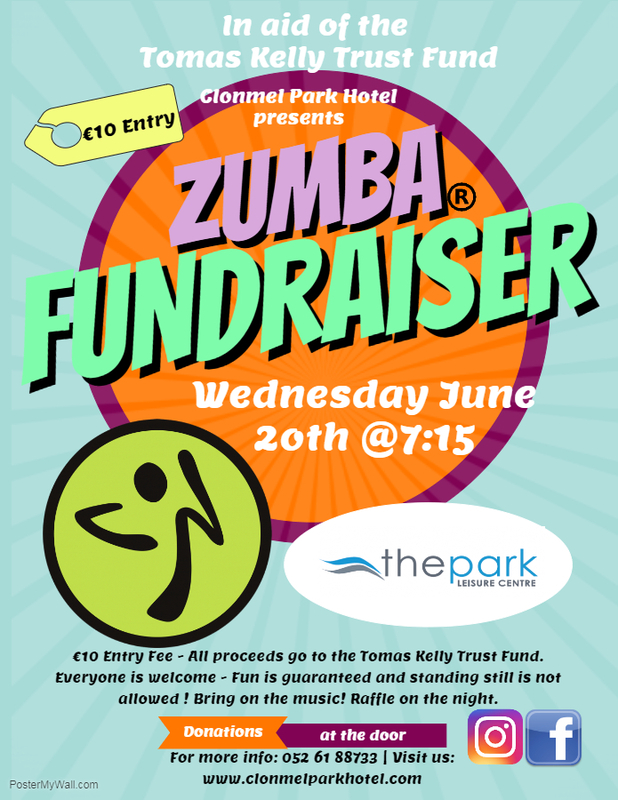 Clonmel Park Hotel hosts a Zumba fundraising event for the Tomas Kelly Trust Fund on Wednesday 20th June at 7:15pm. All are welcome. Zumba is a "social dance party"
Workouts don’t have to be a chore. In fact, workouts don’t have to feel like workouts at all. With Zumba, a workout isn’t even a workout: it’s a fun, social dance party with exercise being the biggest perk. The music is fast, upbeat and contagious, so you can’t help but keep moving. And since it takes place in a group setting at Clonmel Park Hotel Leisure Club, Zumba is by far one of the best ways to get your friends in on your exercise routine. Zumba is both a dance class and a fitness class. Aside from its heart-health benefits, Zumba provides a workout for the whole body. From head and shoulder rolls that loosen up the neck and warm up the upper body to footwork that strengthens and stretches calves and ankles, this fitness method touches on nearly every muscle and joint. Even those who are just learning the dance steps will find themselves waking up the day after a Zumba class with a definitive post-workout feeling. It gets you hooked on exercise - workouts that feel like work are hard to get excited about. But Zumba is so enjoyable you actually want to keep coming back. It completely changes the idea of exercise because it’s something you really look forward to. It will keep you on a healthy routine. because Zumba is based on music and dance, it seems to speak a universal language that people of all nations can related to. There is no large learning curve in a Zumba class. New participants may receive small-scale step rehearsals before some longer dances, but in most cases first-timers can simply jump right into a class and follow along with the instructor. Zumba is the perfect workout to take if you want to get rid of all that stress you accumulate during your every day. The upbeat moves specific to this type of workout favour the release of those mood-improving endorphins, and by joining a Zumba class you’ll surely be able to feel your worries melt away as you lose yourself in the music.